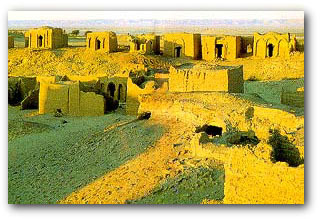 The original settlement, Aghurmi, was superseded by Shali, founded in 1203. Built of salt-impregnated mud, or kharsif, the fortress-like community expanded upwards rather than outwards. Set among thick palm groves, walled gardens and olive orchards, with numerous freshwater springs and salt lakes, modern Siwa clusters beneath the remains of ancient Shali. Climb through the ruins of the old city for magnificent views of the whole oasis. Walk, hire a bicycle or ride in a caretta (donkey cart) to outlying sights and bathing places. These include 26th Dynasty tombs with murals and inscriptions at Jebel al-Mawta (The Hill of the Dead) and the Oracle of Amun, an acropolis temple dating from around 550 BC. Near the Oracle is a ruined Temple of Amun and the famous Cleopatra Bath, a deep pool of bubbling water where you can bathe. Another favorite bathing spot is Fatnis Island, on the salt lake of Birket Siwa, surrounded by palm trees and beautiful scenery.